It’s that time of year again! While it may be hectic at times, it’s always filled with joy and happiness, and the Unwrap a Jaguar Sales Event can help enhance those feelings. During this holiday season, give a gift that will make an impact and get your loved one a new Jaguar. If this luxurious and practical SUV isn’t necessarily what you are looking for, then maybe the hair-raising 2018 Jaguar F-Type is, which can be found at our Little Rock dealership. This sports car comes available in both a coupe and a convertible, and can easily turn a cold drive into a warm and exciting trip. There are plenty of other great models available at a great price this holiday season. 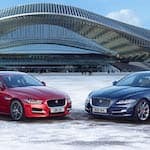 If you are unsure whether or not you want a sedan or a contemporary hatchback, take the Jaguar XF and Jaguar Sportbrake for a test drive each. Jaguar also offers its first compact SUV, the E-Pace, and can bring joy to a lot of families this holiday season. Traveling can be fun this year, and pulling up to Christmas dinner in a new slick ride will be an exciting time. This sales event won’t last forever, so it’s important to take advantage of it while it lasts. These incredible deals end on January 2, so don’t wait! Contact Jaguar Little Rock by calling us at (833) 664-0332 and learn more about the Unwrap a Jaguar Sales Event. We also serve the Bryant area, so come on down!